Climatesense-norpag: Climate Forecasting Methods and Cooling Forecasts - 4 Year Update. Climate Forecasting Methods and Cooling Forecasts - 4 Year Update. 1.The Problems with the IPCC - GCM Forecasting method. Reductionism argues that deterministic approaches to science and positivist views of causation are the appropriate methodologies for exploring complex, multivariate systems ... where the behavior of a complex system can be deduced from the fundamental reductionist understanding. Rather, large, complex systems may be better understood, and perhaps only understood, in terms of observed, emergent behavior. The practical implication is that there exist system behaviors and structures that are not amenable to explanation or prediction by reductionist methodologies ... the GCM is the numerical solution of a complex but purely deterministic set of nonlinear partial differential equations over a defined spatiotemporal grid, and no attempt is made to introduce any quantification of uncertainty into its construction ... [T]he reductionist argument that large scale behaviour can be represented by the aggregative effects of smaller scale process has never been validated in the context of natural environmental systems ... An explosion of uncertainty arises when a climate change impact assessment aims to inform national and local adaptation decisions, because uncertainties accumulate from the various levels of the assessment. Climate impact assessments undertaken for the purposes of adaptation decisions(sometimes called end-to-end analyses)propagate these uncertainties and generate large uncertainty ranges in climate impacts. These studies also find that the impacts are highly conditional on assumptions made in the assessment, for example, with respect to weightings of global climate models(GCMs)—according to some criteria, such as performance against past observations—or to the combination of GCMs used .Future prospects for reducing these large uncertainties remain limited for several reasons. Computational restrictions have thus far restricted the uncertainty space explored in model simulations, so uncertainty in climate predictions may well increase even as computational power increases. ... The search for objective constraints with which to reduce the uncertainty in regional predictions has proven elusive. The problem of equifinality (sometimes also called the problem of “model identifiability”) - that different model structures and different parameter sets of a model can produce similar observed behavior of the system under study - has rarely been addressed. much too short a period to correlate outputs with observation when the controlling natural quasi-periodicities of most interest are in the centennial and especially in the key millennial range. Tuning to these longer periodicities is beyond any computing capacity when using reductionist models with a large number of variables unless these long wave natural periodicities are somehow built into the model structure ab initio. The only natural forcing in both of the IPCC Figures is TSI, and everything else is classed as anthropogenic. The deficiency of this model structure is immediately obvious. Under natural forcings should come such things as, for example, Milankovitch Orbital Cycles, lunar related tidal effects on ocean currents, earth's geomagnetic field strength and most importantly on millennial and centennial time scales all the Solar Activity data time series - e.g., Solar Magnetic Field strength, TSI, SSNs, GCRs, (effect on aerosols, clouds and albedo) CHs, CMEs, EUV variations, and associated ozone variations and Forbush events. He says in Fig 2. Temperature drives CO2 and water vapour concentrations and evaporative and convective cooling independently. The whole CAGW - GHG scare is based on the obvious fallacy of putting the effect before the cause. Unless the range and causes of natural variation, as seen in the natural temperature quasi-periodicities, are known within reasonably narrow limits it is simply not possible to even begin to estimate the effect of anthropogenic CO2 on climate. In fact, the IPCC recognizes this point. "The assessed literature suggests that the range of climate sensitivities and transient responses covered by CMIP3/5 cannot be narrowed significantly by constraining the models with observations of the mean climate and variability, consistent with the difficulty of constraining the cloud feedbacks from observations "
In plain English, this means that the IPCC contributors have no idea what the climate sensitivity is. Therefore, there is no credible basis for the WG 2 and 3 reports, and the Government policy makers have no empirical scientific basis for the entire UNFCCC process and their economically destructive climate and energy policies. The whole idea of a climate sensitivity to CO2 (i.e., that we could dial up a chosen temperature by setting CO2 levels at some calculated level) is simply bizarre because the response of the temperature to Anthropogenic CO2 is simply not a constant, and will vary depending, as it does, on the state of the system as a whole at the time of the CO2 introduction. Because of the built in assumption in all the models that CO2 is the main driver, the actual temperature projections are relatively insensitive as to the particular IPCC climate model used, and, in fact, the range of outcomes depend almost entirely simply on the RCPs chosen. The RCPs depend on little more than fanciful speculations by economists. The principal component in the RCPs is whatever population forecast/speculation will best support the climate and energy policies of the IPCCs client Western governments. "Moreover it is not yet clear which tests are critical for constraining the future projections, consequently a set of model metrics that might be used to narrow the range of plausible climate change feedbacks and climate sensitivity has yet to be developed"
What could be clearer. The IPCC in 2007 said itself that we don't even know what metrics to put into the models to test their reliability (i.e., we don't know what future temperatures will be and we can't calculate the climate sensitivity to CO2). This also begs a further question of what erroneous assumptions (e.g., that CO2 is the main climate driver) went into the "plausible" models to be tested any way. "Although future climate projections cannot be directly evaluated, climate models are based, to a large extent, on verifiable physical principles and are able to reproduce many important aspects of past response to external forcing." The successive uncertainty estimates in the successive "Summary for Policymakers" take no account of the structural uncertainties in the models and almost the entire the range of model outputs may well lay outside the range of the real world future climate variability. By the time of the AR5 report this is obviously the case. Here is just such an example from Spencer. 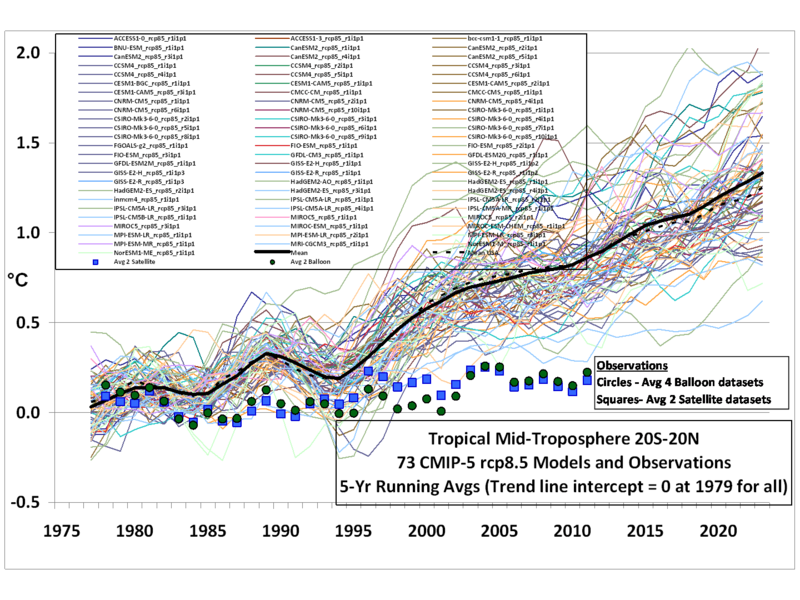 In summary the temperature projections of the IPCC - Met office models and all the impact studies which derive from them have no solid foundation in empirical science being derived from inherently useless and specifically structurally flawed models. They provide no basis for the discussion of future climate trends and represent an enormous waste of time and money. As a foundation for Governmental climate and energy policy their forecasts are already seen to be grossly in error and are therefore worse than useless. A new forecasting paradigm needs to be adopted. "Much of the problem boils down to grid resolution. “The truth is that the level of detail in the models isn't really determined by scientific constraints,” says Tim Palmer, a physicist at the University of Oxford in the United Kingdom who advocates stochastic approaches to climate modeling. “It is determined entirely by the size of the computers.” Roughly speaking, an order-of-magnitude increase in computer power is needed to halve the grid size. Typical horizontal grid size has fallen from 500 km in the 1970s to 100 km today and could fall to 10 km in 10 years' time. But even that won't be much help in modeling vitally important small-scale phenomena such as cloud formation, Palmer points out. And before they achieve that kind of detail, computers may run up against a physical barrier: power consumption. “Machines that run exaflops [1018 floating point operations per second] are on the horizon,” Palmer says. “The problem is, you'll need 100 MW to run one.” That's enough electricity to power a town of 100,000 people. Faced with such obstacles, Palmer and others advocate a fresh start." 2. The Past is the Key to the Present and Future . Finding then Forecasting the Natural Quasi-Periodicities Governing Earths Climate - the Geological Approach. The core competency in the Geological Sciences is the ability to recognize and correlate the changing patterns of events in time and space. This requires a mindset and set of skills very different from the reductionist approach to nature, but one which is appropriate and necessary for investigating past climates and forecasting future climate trends. Scientists and modelers with backgrounds in physics and maths usually have little experience in correlating multiple, often fragmentary, data sets of multiple variables to build an understanding and narrative of general trends and patterns from the actual individual local and regional time series of particular variables. The value of the geologists' approach to understanding the past is proven by the trillions of dollars spent by the oil companies to find and produce the millions of barrels of oil and billions of cubic feet of gas needed daily to fuel the world economy. It works! Earth's climate is the result of resonances and beats between various quasi-cyclic processes of varying wavelengths combined with endogenous secular earth processes such as, for example, plate tectonics. It is not possible to forecast the future unless we have a good understanding of the relation of the climate of the present time to the current phases of these different interacting natural quasi-periodicities which fall into two main categories. The convolution of the a and b drivers is mediated through the great oceanic current and atmospheric pressure systems to produce the earth's climate and weather. After establishing where we are relative to the long wave periodicities to help forecast decadal and annual changes, we can then look at where earth is in time relative to the periodicities of the PDO, AMO and NAO and ENSO indices and based on past patterns make reasonable forecasts for future decadal periods. In addition to these quasi-periodic processes we must also be aware of endogenous earth changes in geomagnetic field strength, volcanic activity and at really long time scales the plate tectonic movements and disposition of the land masses. 2.2 The Present Warming in Relation to the Milankovitch Cycles. 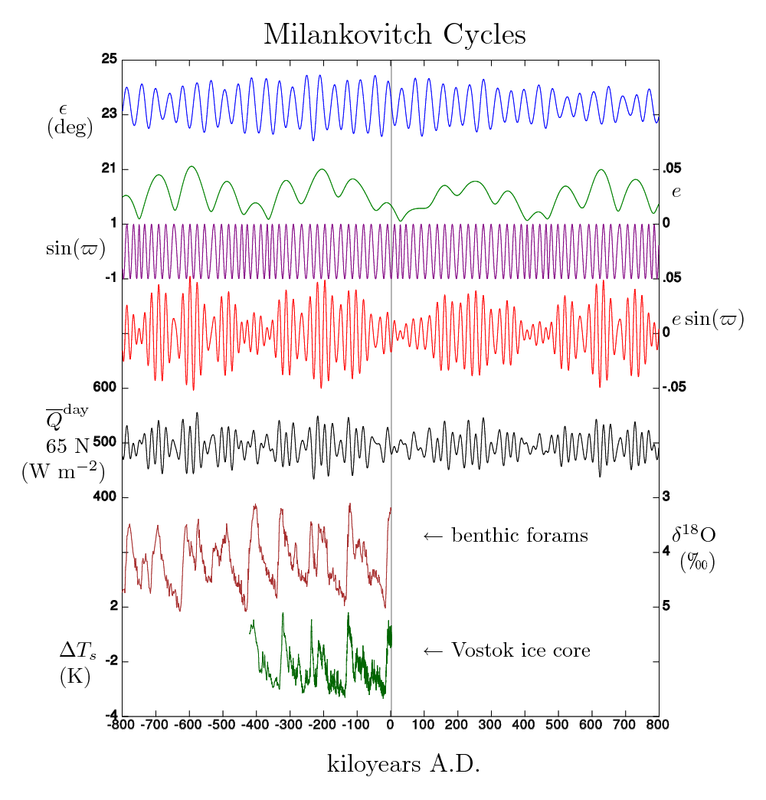 Past and future Milankovitch cycles. — is the calculated daily-averaged insolation at the top of the atmosphere, on the day of the summer solstice at 65 N latitude. The vertical gray line shows current conditions, at 2 ky A. "An often-cited 1980 study by Imbrie and Imbrie determined that ignoring anthropogenic and other possible sources of variation acting at frequencies higher than one cycle per 19,000 years, this model predicts that the long-term cooling trend that began some 6,000 years ago will continue for the next 23,000 years. 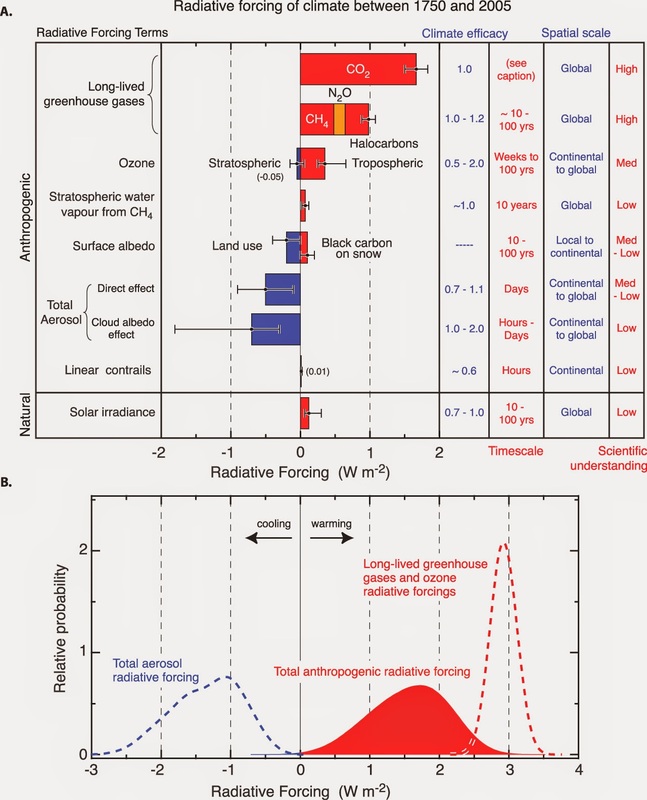 "Recent comparisons pf CO2 and CH4 trends throughMIS-19 with those of the Holocene, in the absence of sea level constraints, have been used to suggest that the Holocene should have terminated already. Kutzbach et al 2009. "Here we propose that the minimum age of a glacial inception is constrained by the onset of bipolar-seesaw climate variability, which requires ice-sheets large enough to produce iceberg discharges that disrupt the ocean circulation. We identify the bipolar seesaw in ice-core and North Atlantic marine records by the appearance of a distinct phasing of interhemispheric climate and hydrographic changes and ice-rafted debris. The glacial inception during Marine Isotope sub-Stage 19c, a close analogue for the present interglacial, occurred near the summer insolation minimum, suggesting that the interglacial was not prolonged by subdued radiative forcing7. Assuming that ice growth mainly responds to insolation and CO2 forcing, this analogy suggests that the end of the current interglacial would occur within the next 1500 years, if atmospheric CO2 concentrations did not exceed 240±5 ppmv." The relative Antarctic temperatures at the Vostock site over the last four glacials and interglacials preceding our Holocene warming peak are shown in dark green in Fig 4. It is of interest to note that Northern Canadian temperatures during the Eemian interglacial (130,000-115,000 years ago) are estimated to be 5 degrees C higher than today, and global sea levels were about 5 meters higher than at present. During the Marine Isotope Stage 11, interglacial Greenland temperatures were about 8 degrees C warmer than today and global sea levels have been variously estimated from 8-20 meters above present day. A final point of interest is the rapid temperature rise which terminates all the glacial periods. The reasons for this rapid warming remain the subject of active investigation, as is the relative length of the interglacial periods. The repeated episodes of rapid warming during the Pleistocene indicate that climate response to the natural drivers is non-linear and some combination of resonances between drivers results in passing a threshold beyond which a period of positive feedback produces rapid change. Of interest in this regard is the current declining trend in the earths obliquity. "Currently the Earth is tilted at 23.44 degrees from its orbital plane, roughly halfway between its extreme values. The tilt is in the decreasing phase of its cycle, and will reach its minimum value around the year 11,800 CE ; the last maximum was reached in 8,700 BCE. 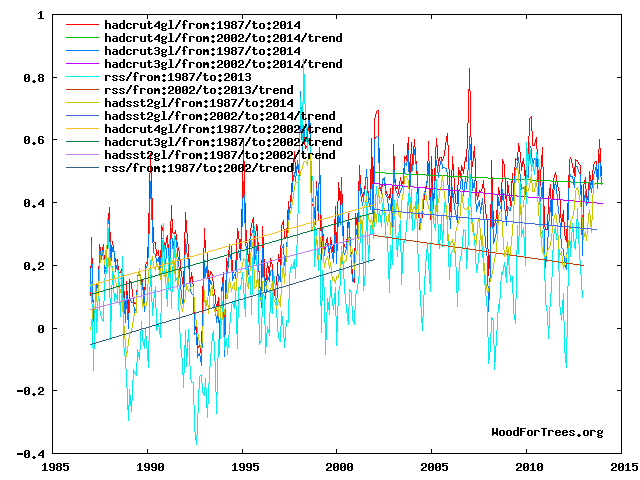 This trend in forcing, by itself, tends to make winters warmer and summers colder (i.e. milder seasons), as well as cause an overall cooling trend. "The present interglacial is about 2oC colder than the previous interglacial, even though the atmospheric CO2 concentration now is about 100 ppm higher. 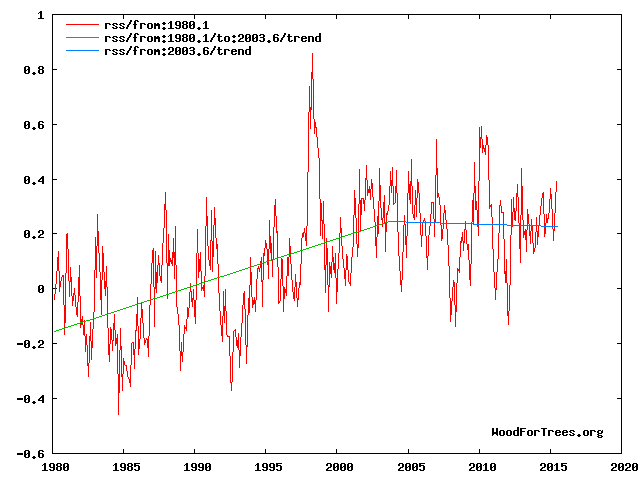 The GISP2 record ends around 1854, and the two graphs therefore ends here. 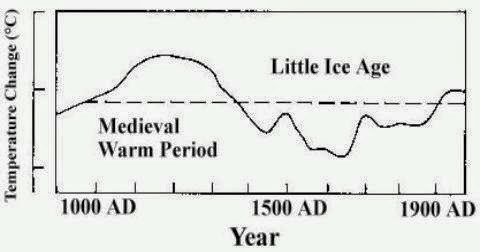 There has since been an temperature increase to about the same level as during the Medieval Warm Period and to about 395 ppm for CO2. ... Clearly Central Greenland temperature changes are not identical to global temperature changes. However, they do tend to reflect global temperature changes with a decadal-scale delay (Box et al. 2009), with the notable exception of the Antarctic region and adjoining parts of the Southern Hemisphere, which is more or less in opposite phase (Chylek et al. 2010) for variations shorter than ice-age cycles (Alley 2003). This is the background for the very approximate global temperature scale at the right hand side of the upper panel. Please also note that the temperature record ends in 1854 AD, and for that reason is not showing the post Little Ice Age temperature increase. In the younger part of the GISP2 temperature reconstruction the time resolution is around 10 years. 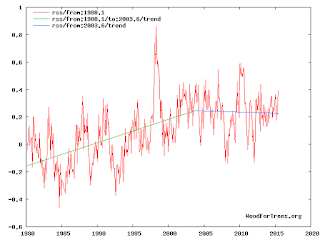 Any comparison with measured temperatures should therefore be made done using averages over periods of similar lengths. During especially the last 4000 years the Greenland record is dominated by a trend towards gradually lower temperatures, presumably indicating the early stages of the coming ice age (Fig.3). In addition to this overall temperature decline, the development has also been characterized by a number of temperature peaks, with about 950-1000 year intervals. 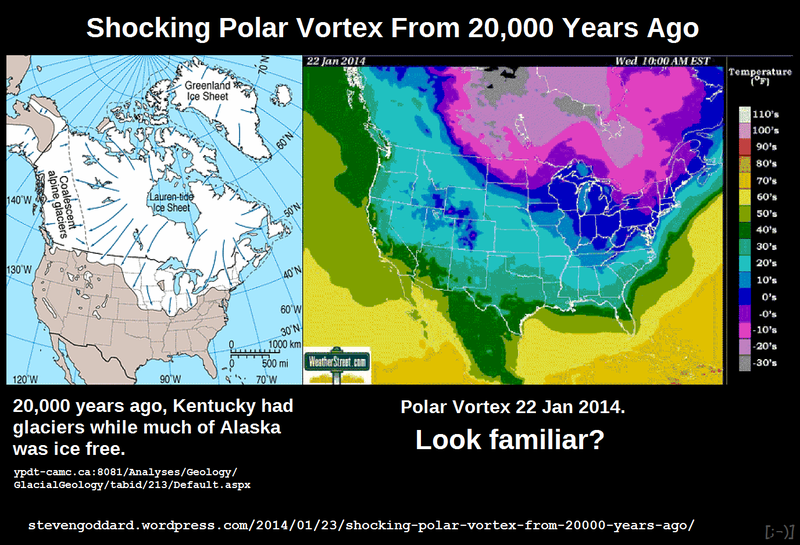 It may even be speculated if the present warm period fits into this overall scheme of natural variations? " I would assert here that the current warm period does indeed reflect a peak in the natural quasi-millennial temperature variation seen in Fig 5, and that temperature and climate trends from AD 2000 - 3000 are likely to more or less repeat the trends from AD 1000 - 2000. I would argue that knowing more precisely the timing of the peak in the current quasi-millennial solar cycle is the key to forecasting climate trends over the next several decades and the next several hundred years. 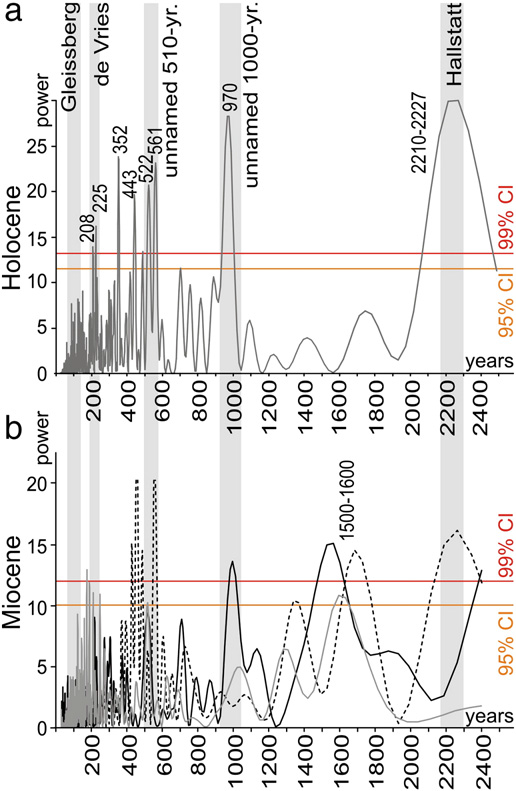 The long term persistence through time of this millennial quasi-periodicity seen in the Holocene in Fig 5 is show by, for example, by Kern 2012. Here spectral analysis of Miocene (about 10.5 million year old) lake proxies shows the persistence of the 1000 +/- year periodicity in solar activity. A comparison of the Lomb–Scargle periodogram of the Holocene sunspot activity with time-converted periodograms of the Miocene proxy data. The overall similarity of the patterns is striking. 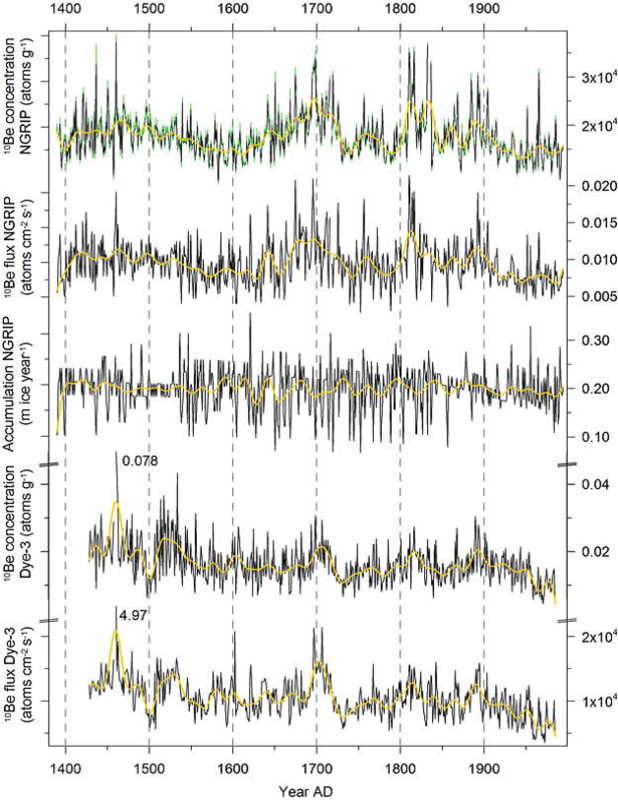 Moreover, the appearance of the non-solar ~ 1500-yr-cycle in the Miocene data sets is obvious. GR: gray line, MS: dashed line, ostracodes: black line. Figure 12 shows in red two filtered solar proxy models (Be10 and C14) and a temperature model (HSG) (taken from Bond et al., 2001) and in black the 980-year beat harmonic produced by the three-frequency astronomical model. As the figure shows, the model well captures the millennial solar/climate cycle. The complex patterns seen in the solar data are produced by interference among the constituent solar/tidal harmonics. I would simply note here of the remarkable coincidence between the 970 year periodicity observed in the Holocene sunspot numbers in Fig 6a from Solanki et al. (2004) and the Miocene Lake series of Kern (Fig.6B ) and Scafetta's 980 year periodicity derived from orbital calculations - Fig 7 and also the 950 - 1000 year +/- periodicity in Holocene temperatures noted by Humlum and seen in Fig 5 above. The shape of the curve of Fig 9 ( Fig 5 Christiansen) ) from 1000 - the present should replace the Mann-IPCC Al Gore hockey stick in the public consciousness as the icon for climate change and a guide to the future. 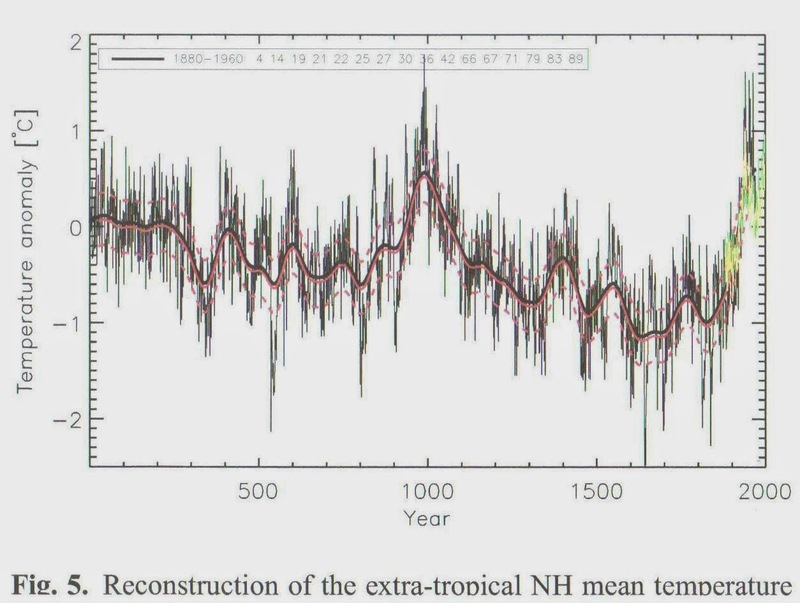 Note the close relationship seen here in panels 3C and 3D (Steinhilber) between the periods of low solar activity and low solar magnetic field strength as evidenced by the high cosmic ray intensity peaks and the various temperature minima of the Little Ice Age. Panel D also suggests that the current temperature peak is related to a Grand Maximum in solar activity in the late 20th century. This is demonstrated also by the Dye 3 ice core 10 Be record - Fig 11 - which shows the 20th century with the lowest 10Be flux (highest solar activity ) in the last 600 years. That the 20th century was the time of a long term solar maximum is further demonstrated by Lockwood et al 2014. Figure 6. 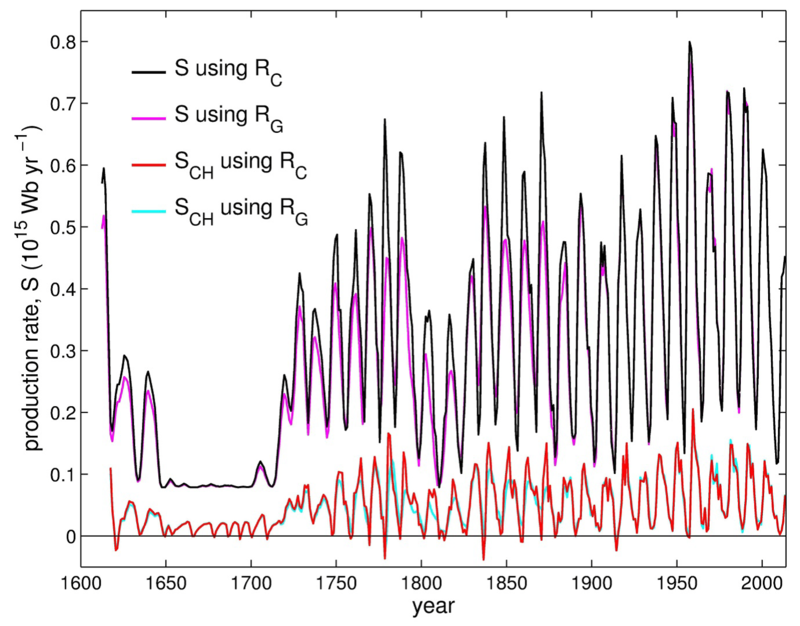 Modeled variations of annual means of signed open solar flux, FS. 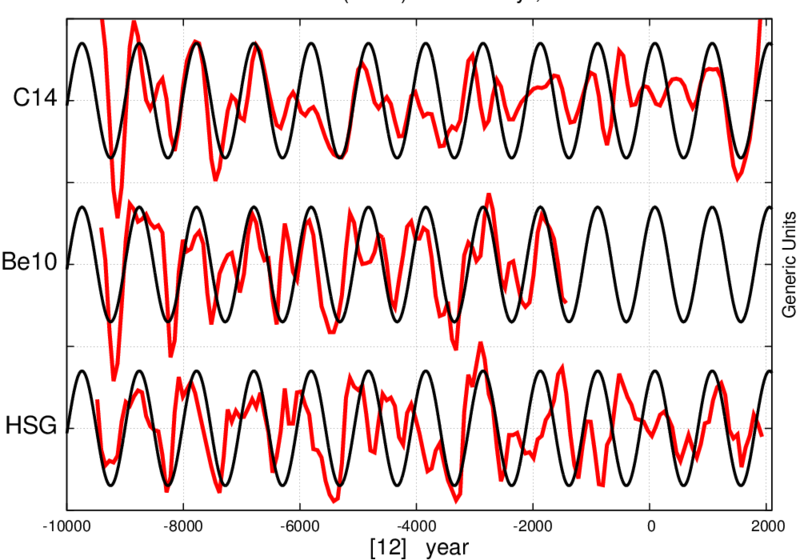 The blue line is based on RC, and the red line is based on RG. Note that for many years the red line is not visible as it is overlaid by the blue line. 25-year averages of the heliospheric modulation potential exceeds 600 MV. predictions that the grand maximum will end in the years 2013, 2014, or 2027 using VSW, FS, or B respectively". My own view ,based on the Ap index Fig 13 and Oulu neutron count - Fig 14 is that the solar activity maximum peaked in about 1991.with the sharp decline beginning about 2005 - 6. NOTE!! The connection between solar "activity" and climate is poorly understood and highly controversial. Solar "activity" encompasses changes in solar magnetic field strength, IMF, CRF, TSI, EUV, solar wind density and velocity, CMEs, proton events etc. The idea of using the neutron count and the 10Be record as the most useful proxy for changing solar activity and temperature forecasting is agnostic as to the physical mechanisms involved. c) the changing TSI - especially on millennial and centennial scales. Of particular interest is whether the perihelion of the precession falls in the northern or southern summer at times of higher or lower obliquity. 2.4 The 60 year Cycle and Decadal scale periodicities. Over the last 130 years an approximate 60-year cycle is seen in the temperature data and, although with less regularity, also in the PDO index . Figs 15 and 16. Sophisticated statistical analysis actually wouldn't add much to eyeballing the time series. The 60-year periodicity in Fig 16 modulates the underlying longer wave 1000-year quasi-periodicity seen in Figs 5, 6, 7, and 9 above. Figure 15 shows warming from about 1910-1945, cooling from then to about 1976, warming to about 2003-2005, and cooling since then. Total warming during the 20th century was about 0.8 degrees C.
The quasi-periodic orbital and solar drivers produce emergent patterns and trends in the regional climate and weather patterns via the great oceanic current and atmospheric pressure systems. "If the same climatic patterns, cyclic warming and cooling, that occurred over the past 500 years continue, we can expect several decades of moderate to severe global cooling." Note that this prediction would be in addition to cooling from the underlying millennial trend now entering its cooling phase. There has now been no net warming for 16 years and the earth entered a cooling trend in about 2003 (Fig 17), which will likely last for another 20 years and perhaps for hundreds of years beyond that. 3. Cooling Forecasts - Update and Observations. 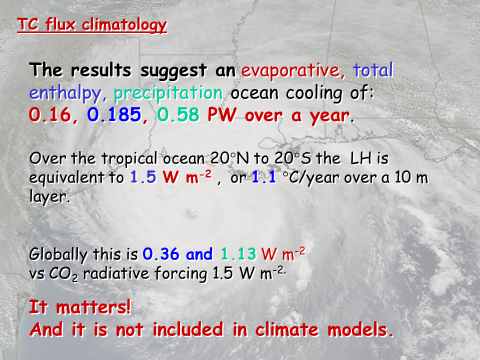 During the last few years I have laid out an analysis of the basic climate data and of the methods used in climate prediction. From these I have developed a simple, rational and transparent forecast of the possible timing and extent of possible future cooling by considering the recent temperature peak as a nearly synchronous peak in both the 60- and 1000-year cycles and by using the neutron count and AP Index as supporting evidence of a coming cooling trend. 6/18/10 Thirty Year Climate Forecast. 5/14/13 Climate Forecasting for Britain's Seven Alarmist Scientists and for UK Politicians. 7/30/13 Skillful (so far) Thirty year Climate Forecast- 3 year update and Latest Cooling Estimate. 10/9/13 Commonsense Climate Science and Forecasting after AR5 and the Coming Cooling. "A general earth cooling is thus more likely as was the case from 1940 to 1970 when similar conditions prevailed. Concurrent changes in the Arctic Oscillation suggest a pattern of meridional atmospheric flow will be more common than the more latitudinal flows of warmer periods. Policymakers may wish to note the following possible effects on earth’s climate for the next 20 – 30 years. A cooler world with lower SSTs usually means a dryer world. Thus droughts will be more likely in for example east Africa with possible monsoon failures in India. In California the PDO will mean less rainfall with more forest fires in the south. However in the Cascades and Northern Sierras snowpack could increase since more of the rain could occur as snow. Northern Hemisphere growing seasons will be shorter with occasional early and late frosts and drought in the US corn belt and in Asia repeats of the harsh Mongolian and Chinese winters of 2009 – 10 . In Europe cold snowy winters and cool cloudy summers will be more frequent . There will be a steeper temperature gradient from the tropics to the poles so that violent thunderstorms with associated flooding and tornadoes will be more frequent in the USA, At the same time the jet stream will swing more sharply North – South thus local weather in the Northern hemisphere in particular will be generally more variable with occasional more northerly heat waves and more southerly unusually cold snaps. In the USA hurricanes may strike the east coast with greater frequency in summer and storm related blizzards more common in winter. " "Two more years of Termperature, Ocean Current patterns, and Solar, and "weather" data have considerably confirmed and strengthened the original forecast. Meanwhile the weather patterns - particularly in the US and Europe - have been as forecast in the earlier post." 1) The millennial peak is sharp - perhaps 18 years +/-. We have now had 16 years since 1997 with no net warming - and so might expect a sharp drop in a year or two - 2014/16 - with a net cooling by 2035 of about 0.35.Within that time frame however there could well be some exceptional years with NH temperatures +/- 0.25 degrees colder than that. 2) The cooling gradient might be fairly steep down to the Oort minimum equivalent which would occur about 2100. (about 1100 on Fig 9) with a total cooling in 2100 from the present estimated at about 1.2 +/-. 3) From 2100 on through the Wolf and Sporer minima equivalents with intervening highs to the Maunder Minimum equivalent which could occur from about 2600 - 2700 a further net cooling of about 0.7 degrees could occur for a total drop of 1.9 +/- degrees. 4) The time frame for the significant cooling in 2014 - 2016 is strengthened by recent developments already seen in solar activity. With a time lag of about 12 years between the solar driver proxy and climate we should see the effects of the sharp drop in the Ap Index which took place in 2004/5 in 2016-17. 8 The effect of increasing CO2 emissions will be minor but beneficial - they may slightly ameliorate the forecast cooling and help maintain crop yields . 9 Warning !! There are some signs in the Livingston and Penn Solar data that a sudden drop to the Maunder Minimum Little Ice Age temperatures could be imminent - with a much more rapid and economically disruptive cooling than that forecast above which may turn out to be a best case scenario." b) Global Forecast - item1. Significant temperature drop now forecast for 2017-18.
c) Global Forecast - item 9. Another year of flat Livingston and Penn umbral data suggests that a swift decline into a Maunder Minimum is now very unlikely. "There will be a steeper temperature gradient from the tropics to the poles so that violent thunderstorms with associated flooding and tornadoes will be more frequent in the USA. At the same time the jet stream will swing more sharply North – South thus local weather in the Northern hemisphere in particular will be generally more variable with occasional more northerly heat waves and more southerly unusually cold snaps"
Global temperature trends, solar activity and the climate and weather patterns since the original 2010 forecast have simply strengthened confidence in the forecast of both imminent decadal and long-term centennial cooling as outlined above. Other investigators have suggested lags between 12 and 20 years. We will see. How confident should one be in the predictions in this post? The pattern and quasi-periodicity method doesn't lend itself easily to statistical measures. However, statistical calculations only provide an apparent rigor for the uninitiated and, in relation to an ensemble of IPCC climate models, are entirely misleading because they make no allowance for the structural uncertainties in the model set up. This is where scientific judgment comes in, as some people are better at pattern recognition and meaningful correlation than others. A past record of successful forecasting such as indicated above is a useful but not infallible measure. In this case I am reasonably sure (say 65/35) for about 20 years ahead. Beyond that certainty drops rapidly. I am sure, however, that they will prove closer to reality than anything put out by the IPCC, Met Office or the NASA group. In any case, this is a Bayesian type forecast in that it can easily be amended on an ongoing basis as the Temperature and Solar data accumulate. If there is not a 0.15 - 0.20 drop in Global SSTs by 2018 -20, I would need to re-evaluate. As to the future, the object of forecasting is to provide practical guidance for policy makers. The rate, amplitude and timing of climate change varies substantially from region to region so that, after accounting for the long term quasi-millennial periodicity, I would then estimate the modulation of this trend by providing multi-decadal climate forecasts for specific regions. This would be accomplished with particular reference to the phase relationships of the major oceanic and atmospheric systems PDO AMO, NAO, ENSO etc, a la Aleo and Easterbrook linked to in section 2.4 above. The earth has been subdivided into tectonic plates. It would be useful to have, as a guide to adaptation to climate change, multi-decadal regional forecasts for the following suggested climate plates, which are in reality closely linked to global geography. 1 North America and Western Europe. 11 The intra tropical Pacific Ocean. Detailed analysis of the energy exchanges and processes at the ocean /atmosphere interface in this area is especially vital because its energy budget provides the key to the earth's thermostat. Wow, somebody talks sense on this much abused subject. Well done and please keep it up. Your remarks about the IPCC were spot on - to which I would add that by use their prerferred method of adjusting, adveraging, and homogenizing temperature/climate data for each country and continent they effectively blur all the real features. Like blurring a picture then trying to get accurate information from it by statistical methods. It's barking mad and backwards! They have failed to realize that the gems are in the details and that is planet is a aggregation of macro climates that have to be treated as such. Global climate is utter rot in my book, we have local climates that build on each, other sometime positively (for a particular outcome) often, thankfully they work against each other. 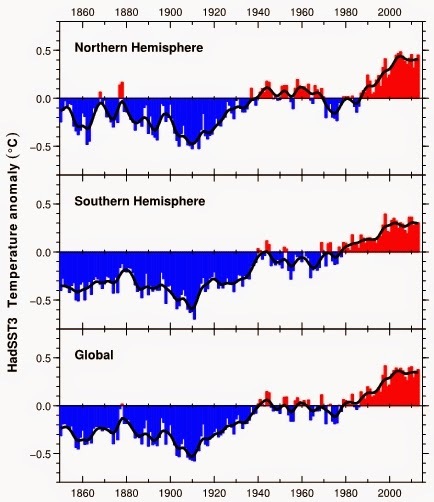 Currently most regions appear to be marching the same way - and that is not towards warming. But you understand these thing better than I could possibly, so keep up this important work and good luck. Good science & good sense on climate, a rare bird. Thanks in particular for the forecasting, an extremely rare bird. Where have you been all my life? Thank you so much for this information. Something about global warming never added up me and now I see why. I knew there was a reason they changed the term from global warming to climate change, even the current powers to be, are seeing the same thing as you. They just don't want to admit their mistake or lose their funding. You seem to be right on, and you are the only person I have seen that actually acknowledges their limitations in predicting the global climate. I have added your site to my favorites list. I live in nearby Rosenberg. "...three irrational and false assumptions... Third, that the GHE of water vapour is always positive. As to the last point, the feedbacks cannot be always positive otherwise we wouldn't be here to talk about it." That reflects a misunderstanding of what it means for a feedback to be "positive." You seem to think that a "positive" feedback is necessarily >100%. That is not correct. Positive feedbacks of less than 100% do not result in instability. Consider a linear system with a positive 10% feedback from the output to the input. An input increase of 1.0 will "feed back" +10% to become, effectively 1.1. The ".1" (additional part) is also then amplified by 10%, becoming .11, etc. The 10% feedback ends up, in the long term, asymptotically approaching an 11.111111111111...% amplification. ncdave. Thanks for the comment .To hopefully avoid confusion I've deleted the statement " otherwise we wouldn't be here to talk about it "